This northern Thailand city is rich in history and culture - and is surrounded by unspoiled natural beauty in the hills and mountains. It's the Wat Phra That Doi Suthep temple on a high hill overlooking Chiang Mai. The traditional architectural design is superb. 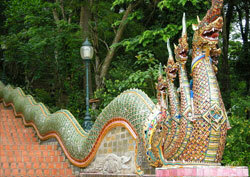 Many visitors energetically reach the temple by walking up a steep 290-step hillside stairway guarded at its base by photogenic Naga snake sculptures (see photo). The less physically motivated take the cable car. They include The temples of Wat Chedi Luang and Wat Phra Singh Day excursions for elephant riding, hill tribe visiting, jungle trekking, white-water rafting Museum hopping Handcrafted souvenir shopping Thai cooking and massage courses. Regrettably, over the past decades the Chiang Mai urban landscape has been giving way to contemporary structures. Still, much of the endearing Chiang Mai heritage remains - and the locals are as commendably friendly as ever. Chiang Mai literally means "new city", which it was when it was founded in 1296. Chiang Mai is intrinsically hot despite being in the hills. It's coolest from Mid-November to January, and that's the best time to visit. Try to avoid March to May (the hottest months) and May through early Fall (the wettest period).